What Vitamins Do Mushrooms Have? The ancient Egyptians believed mushrooms were the plant of immortality, and while they may not help you live forever, mushrooms provide nutrients to keep your body healthy. Mushrooms come in many varieties, including white button, portobello and shiitake. You can grill, sauté or roast them, add them to dips, sauces and soups, or top salads with them. Whichever way you choose to eat mushrooms, they will put you one step closer to meeting your need for many of the vitamins you don't usually find in the produce section. One cup of white button mushrooms supplies you with 7 percent of the DRI for thiamin, or vitamin B-1; 30 percent of the DRI for riboflavin, or vitamin B-2, for men and 35 percent for women; and 22 percent of the DRI for niacin, or vitamin B-3, for men and 25 percent for women. The B vitamins allow you to produce energy, metabolize fats and proteins, and keep your skin, hair, eyes, liver and nervous system healthy. Shiitake and portobella mushrooms are slightly lower in thiamin and riboflavin, but higher in niacin, while oyster mushrooms have a higher content than all three vitamins. 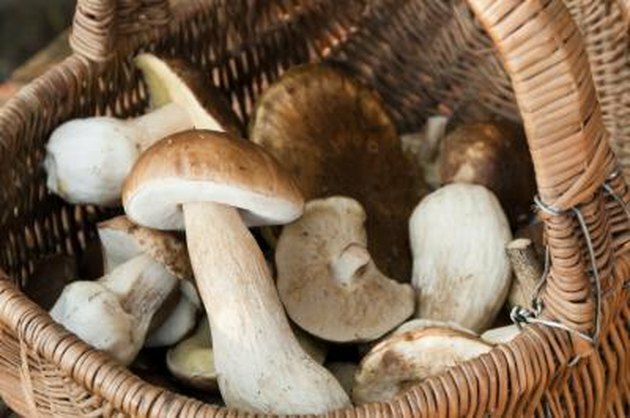 Mushrooms might actually boost your mood, especially shiitake and portobella mushrooms. One hundred grams, or about five whole shiitake mushrooms, contain 23 percent of the DRI for vitamin B-6 for adults 19 to 50 years. One cup of portobella mushrooms contains 10 percent, one cup of oyster mushrooms contains 7 percent and one cup of white mushrooms contains 8 percent of the DRI of this vitamin. Vitamin B-6 allows you to make hormones that influence your mood and regulate your body's internal clock and is vital for normal brain development and function. Mushrooms are your only option for vitamin D when you're shopping for produce. They make vitamin D the same way you do -- when exposed to sunlight. Mushrooms are typically grown in the dark, but some are grown under ultraviolet light to promote vitamin D production. "Health" magazine cites Dole portobella mushrooms as an example -- one cup contains 400 International Units, or 66 percent, of the DRI of vitamin D. Vitamin D works with calcium to build your bones and keep them strong. A 2012 article on the Huffington Post website encourages you to leave your mushrooms out in the sun to increase their vitamin D content. Mushrooms give you small amounts of folate, vitamin B-12 and vitamin C. Folate is critical for rapidly growing cells and you need it to make genetic material and to keep your brain functioning properly. Vitamin B-12 works with folate to improve your immune system and mood and it's especially important for your nerve cells and genetic material. Your body uses vitamin C to form a protein necessary for skin, ligaments, blood vessels and tendons. You also need it to heal wounds and keep your bones and teeth healthy. What Are the Benefits of Mushrooms for Pregnant Women?